A team of Fowler General Construction Inc. of Richland, Washington, and TVA Architects Inc. of Portland, Oregon, will design and construct the new PNNL Collaboration Center in Richland. RICHLAND, Wash. — A contract has been awarded to a pair of Northwest architecture and construction firms to design and construct a new building that will allow Pacific Northwest National Laboratory to host larger scientific meetings, and increase collaboration among researchers and other scientific institutions. The design-build contract was awarded this week to the team of Fowler General Construction Inc. of Richland, Washington, and TVA Architects Inc. of Portland, Oregon. 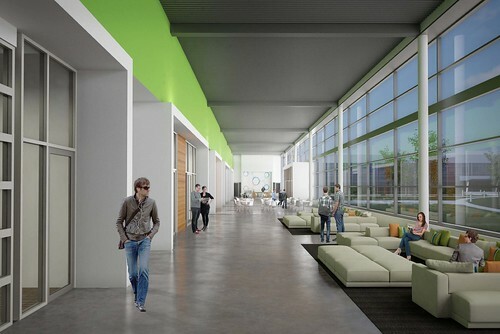 The 24,000-square-foot Collaboration Center will cost approximately $9.8 million to design, construct and furnish. It will be located at the intersection of Horn Rapids Road and Innovation Boulevard on the north end of the PNNL campus, adjacent to PNNL's Physical Sciences Facility. Construction will start later this year and be complete in fall 2017. "The center will allow PNNL to host larger and more frequent scientific meetings, workshops, training and science-focused events," said PNNL Director Steven Ashby. "We expect this facility to result in an increased number of visitors to PNNL and to the Tri-Cities." Ashby also noted the center will enhance collaboration within PNNL as well as between scientists and engineers at the national laboratory, research universities and other scientific research organizations. "At PNNL, we address some of the nation's most challenging problems in energy, the environment and national security. But we can't do this alone. Partnership and collaboration with other top research institutions is essential to increase the rate and impact of scientific discovery." The Collaboration Center also will act as a 'gathering place' that will encourage casual collaboration and connection among PNNL staff, bringing them together in a state-of-the-art facility. The new center will offer both formal and informal meeting spaces including breakout areas and casual, small seating areas, along with accommodations for large-scale events for up to 450 people in a single session. The center will also serve as the first-stop for laboratory visitors and badging. Food services will include an onsite café for staff and visitors as well as accommodations for catering services to support larger events. The Collaboration Center is part of a ten-year campus renewal strategy to acquire, modernize and sustain facilities and infrastructure to ensure PNNL is equipped to meet DOE's and the nation's multi program research priorities. "The Collaboration Center will complement our new and existing facilities by adding needed modern, collaborative space in close proximity to diverse research while also addressing other site needs," said Roger Snyder, manager of the Department of Energy's Pacific Northwest Site Office. As part of this strategy, PNNL opened its new Systems Engineering Building in August, a 24,000-square-foot facility which houses control rooms, testing platforms and laboratories used to address grid modernization, buildings efficiency, renewable energy integration and other energy challenges. A 16,000-square-foot general purpose chemistry laboratory is nearly complete and will open this spring. Laboratories in this building will be used to support a variety of DOE-funded programs and research. And a two-story office building is also under construction. This 26,000-square-foot facility will house over 100 PNNL staff engaged in energy and national security research, and will be complete in early 2017.